This flight nearly did not happen. To all good intent, the only reason I chose this routing was to get another flight on the A380. 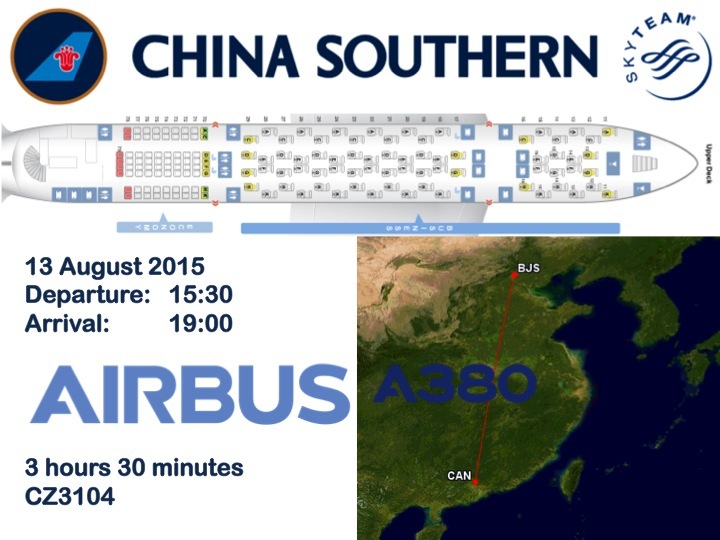 At the time of booking there were two daily flights from Beijing to Guangzhou operated by China Southern’s A380: CZ3000 at 09h30 in the morning and CZ3104 in the afternoon at 15:30. Originally I booked the earlier flight. 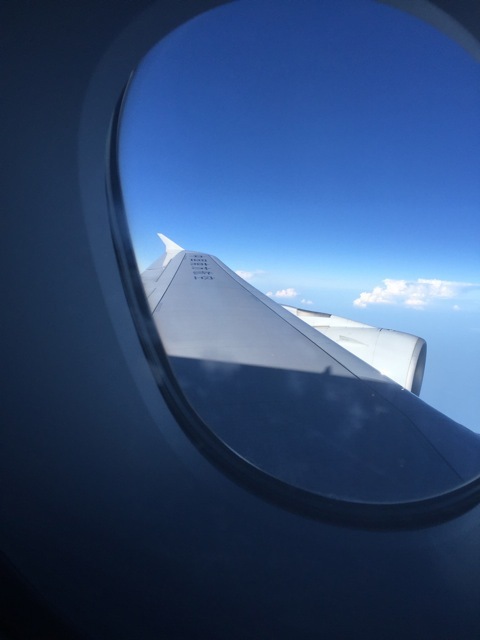 However, about two weeks before departure, I checked my itinerary again, only to find that there had been an aircraft change and the flight would be operated by an A330-300 instead. Please do not get me wrong. 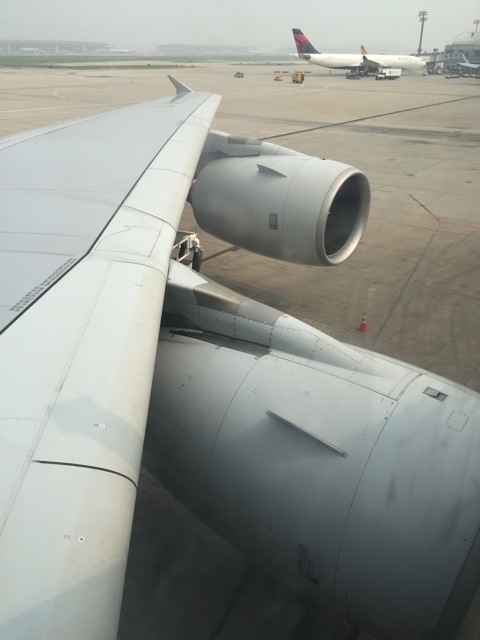 I think the A330-300 is one of the most elegant airliners out there, while the A380’s looks are – quite frankly – sinful. But that is not the point. And then the saga began. I shall spare you the gory details. 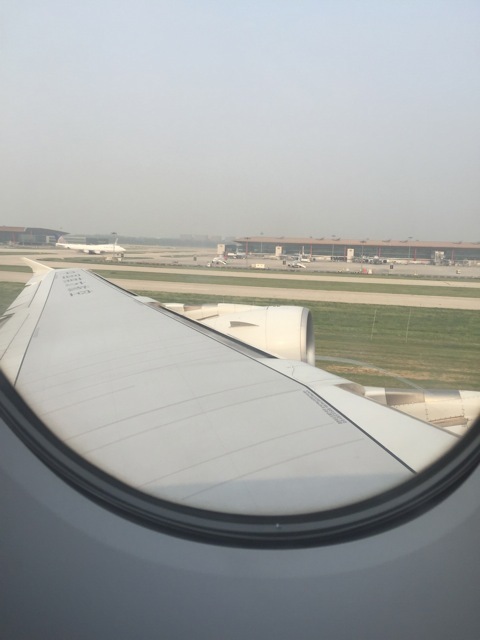 But what I will say is that it took me no less than six calls to the Frankfurt office and another seven phone calls to the Beijing office before eventually I was able to rebook my ticket. 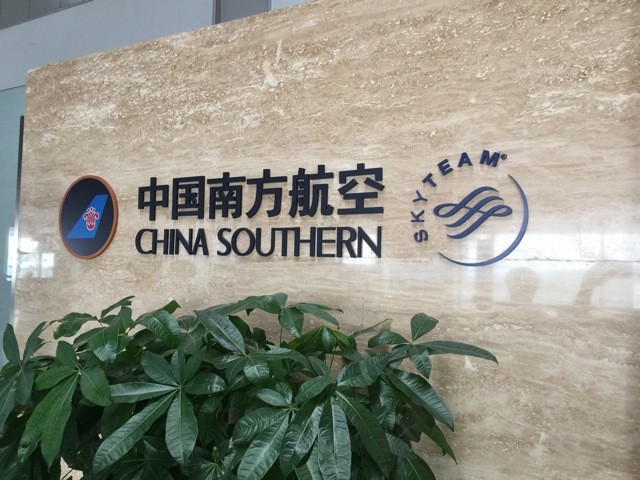 I must say though, that while the process itself is absolutely atrocious and not at all passenger friendly, China Southern’s staff were friendly and very polite at all times. Transport: Car provided by the hotel. It is a BMW, but I have no idea what model. The journey back the airport is fairly smooth. There is a bit of a traffic jam right outside the hotel, but that soon eases up. Location: Terminal 2, domestic departures. Facilities: Web check-in is available. 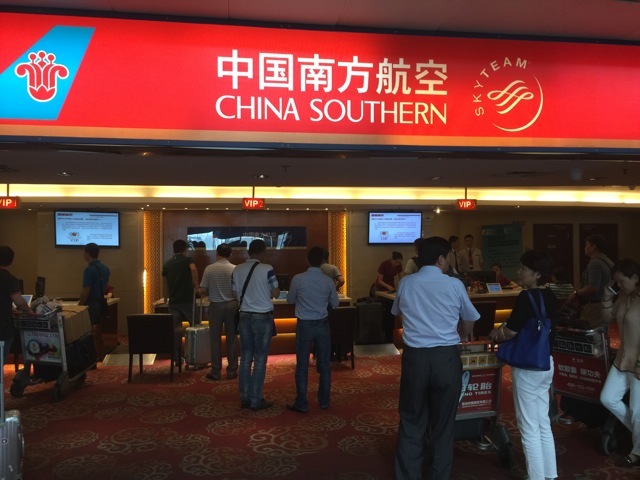 Counters: There is a dedicated check-in area for China Southern’s VIP customers. 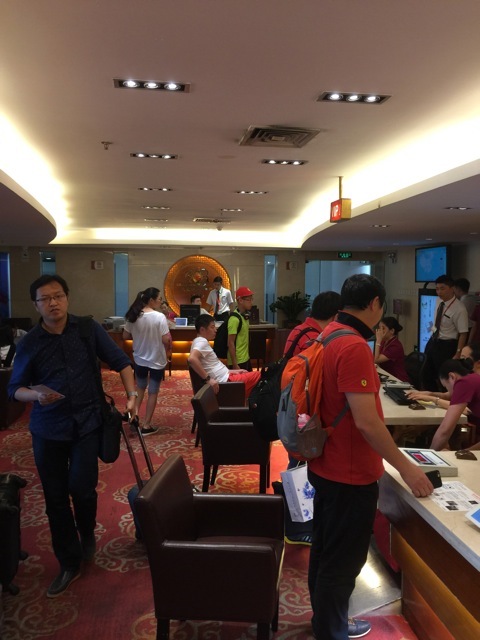 Unfortunately, the place is not signposted in any way, so eventually I have to ask at one of the airline’s ticketing counters for directions to the premium check-in area. The VIP check-in area is quite large, with six or seven counters and chairs for passengers to sit while they wait to be checked in. There are no conveyor belts for luggage, just the scales. 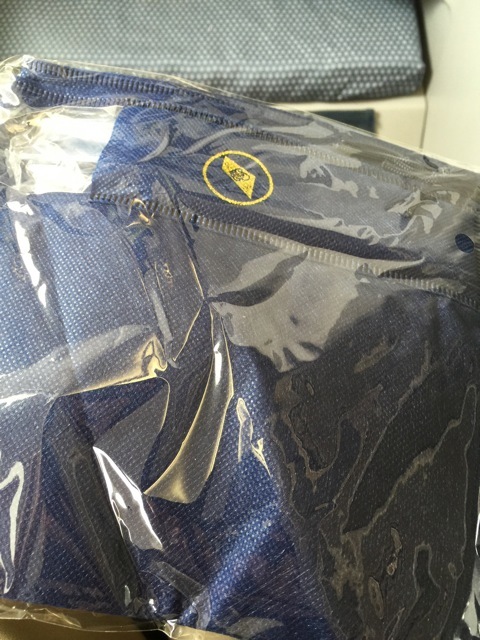 A porter will then take your checked luggage and put it on a belt for you. 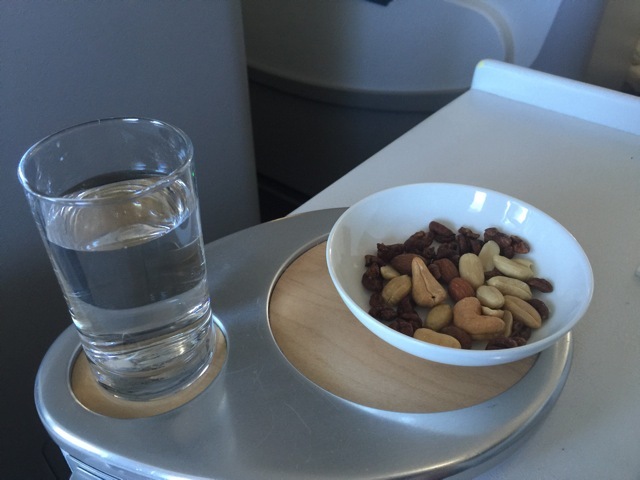 In theory it is a nice idea and is very similar to the dedicated First Class area many other carriers have. Quite frankly though, the place here just looks grimy and filthy. The carpets are tread bare in some places, while in other places there are stains and lumps of dust that look suspiciously like the fur balls my cat Boozey used to wretch up. The exit from the check-in area is to the left. 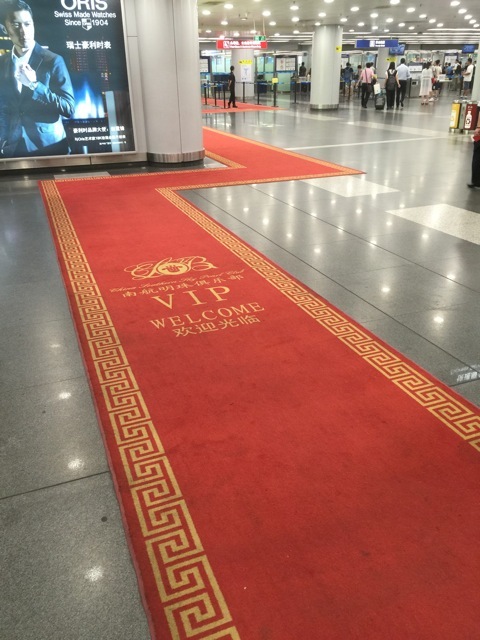 From there a red carpet will guide you to the security check for First Class and Business Class passengers. 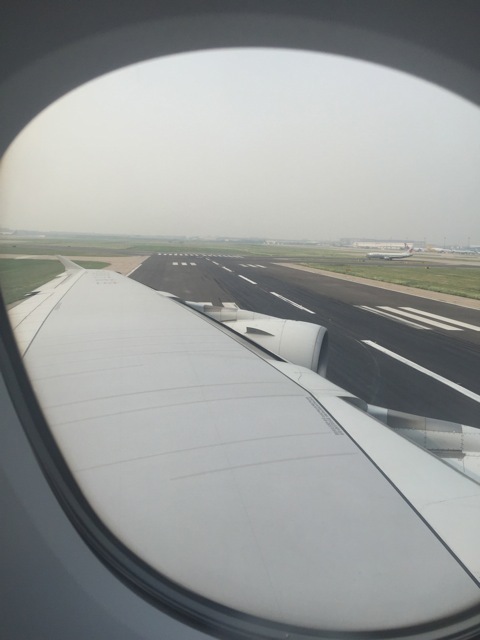 Location: Opposite gate 21, from where the A380 flights depart. 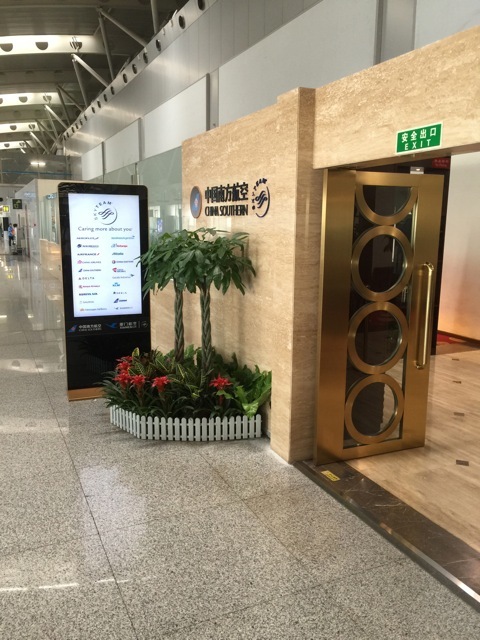 Type of Lounge: Dedicated China Southern First Class lounge. 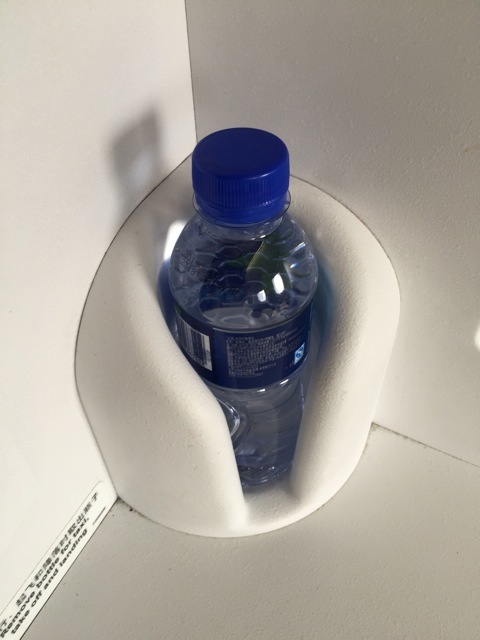 Facilities: A limited selection of food and drinks, no toilets or showers available. Internet: Complimentary wifi is provided by the airport authority. However, you need a Chinese mobile number to receive the password to access the internet! 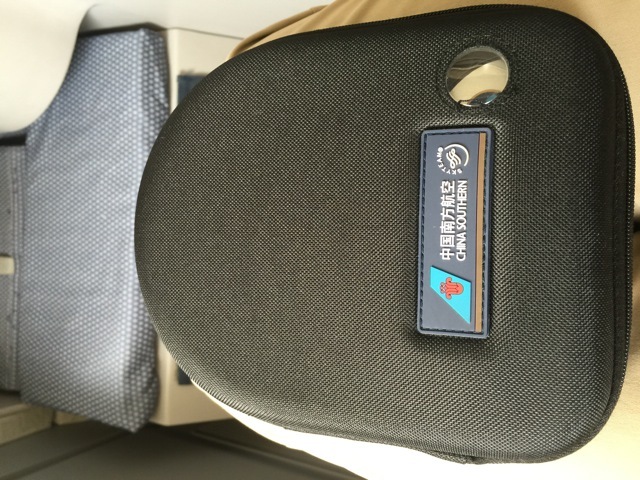 I am issued a lounge invitation together with my boarding pass. There is a small map on the invitation, indicating the location of the lounges. 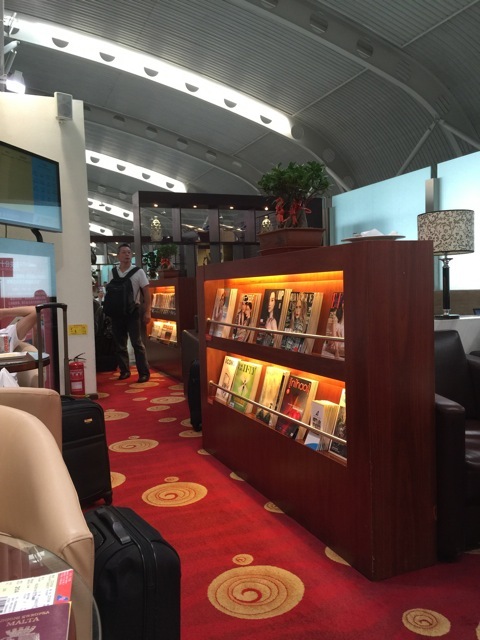 There is the ‘normal’ VIP lounge and then there is the ‘A380 high-end passenger lounge’ next to the departing gate for the A380 flights. I think somebody is missing the point here. Actually, I think somebody is missing quite a few points here. First of all, of course it is nice to have a lounge adjacent to the departing gate, but that really only makes sense if there is a direct access from the lounge to the aircraft, similar to what Lufthansa or Emirates have at their hubs or like what BA used to have in Heathrow’s Terminal 4, where passengers had direct access from the Concorde Room to the aircraft. But this is obviously not the case here. 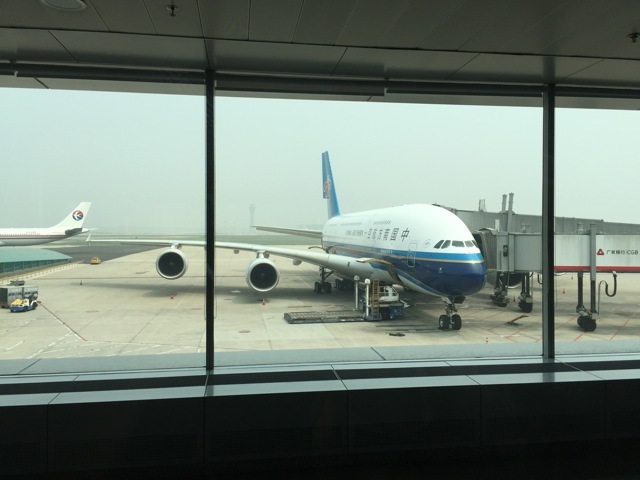 Secondly, you would have thought it is a simple enough calculation: the number of Business Class seats on the A380 dictates the capacity of the lounge. 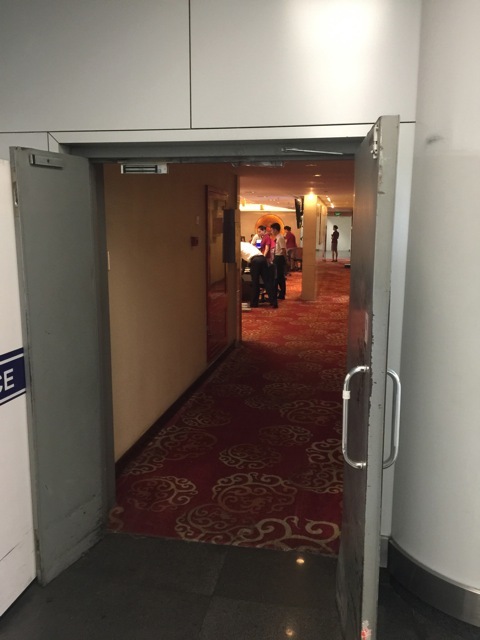 But this is clearly not the case here and at some point the staff actually start setting up folding chairs for all the passengers wishing to enter the lounge. 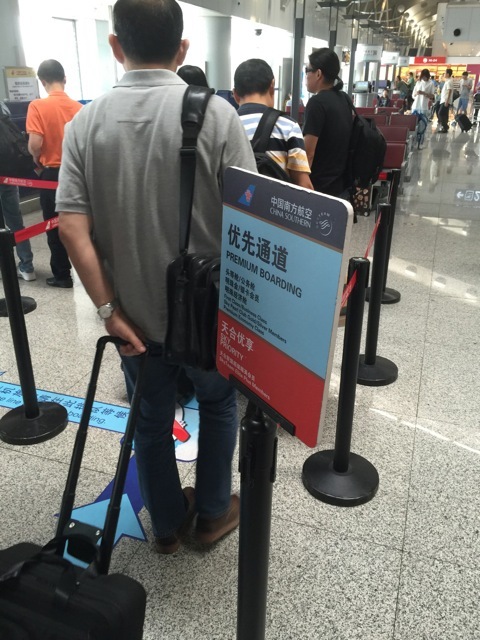 Priority Boarding: Dedicated line for First Class passengers. Boarding is chaotic. 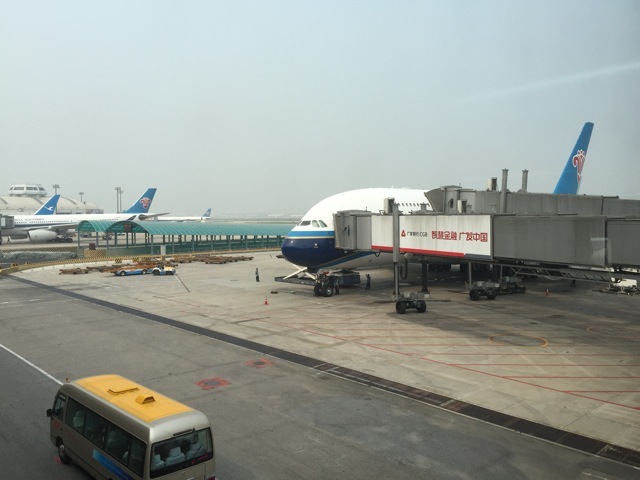 Even so, by 15h30 – our scheduled departure time – the airbridges are removed from the aircraft. That is when the captain comes on the loudspeaker to welcome us aboard and inform us about an ATC delay of thirty minutes. Eventually by the time we push back from the gate we are running more than an hour later. Configuration: 1 + 2 + 1. 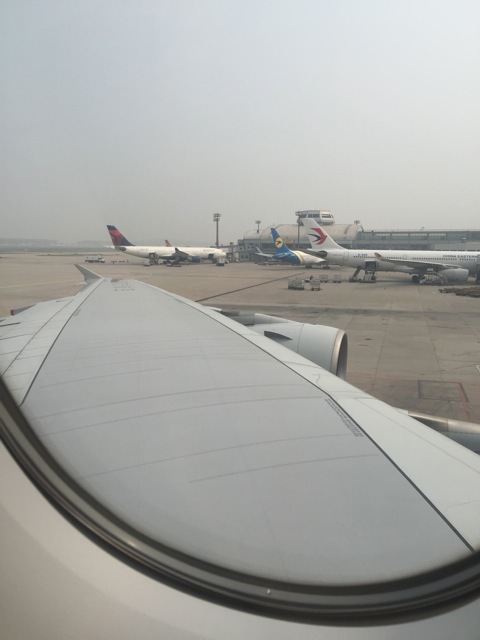 Seat: I am sitting on 20A, which is a window seat on the port side of the aircraft. 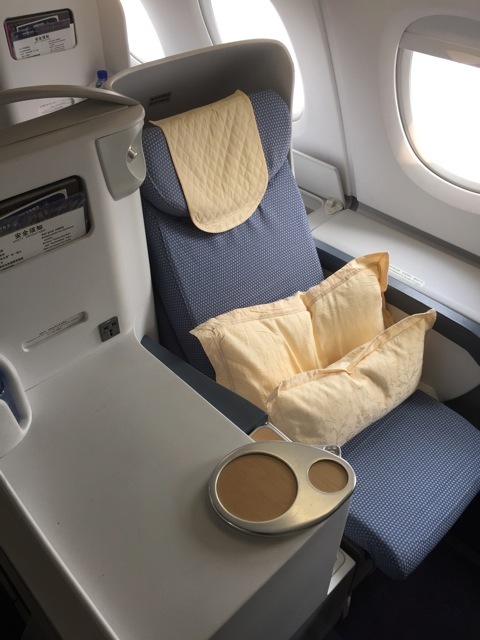 China Southern has the Business Class cabin on the upper deck of the aircraft. There are seventy seats in total. There is a smaller cabin with six rows in the forward section, with the main section behind the second galley. 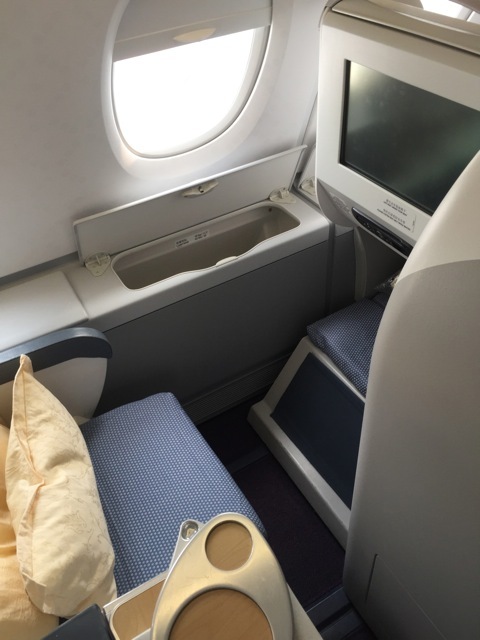 The seat itself is very similar to the one Emirates has installed in Business Class on its A380. It is a comfortable seat and offers a lot of privacy. 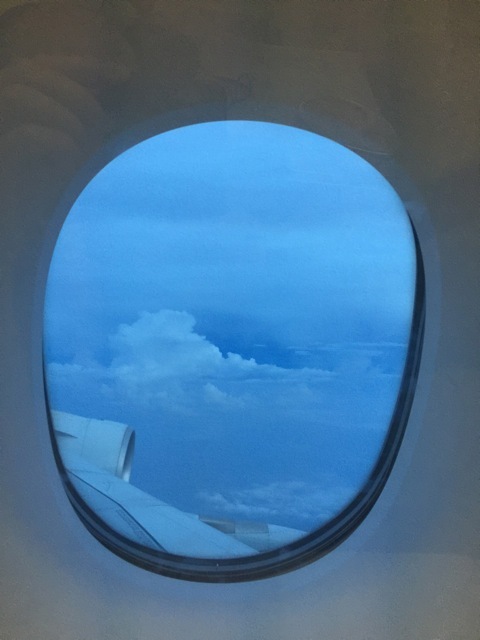 In the smaller cabin, the window seats on uneven numbered rows offer more privacy, because they are farther away from the aisle. 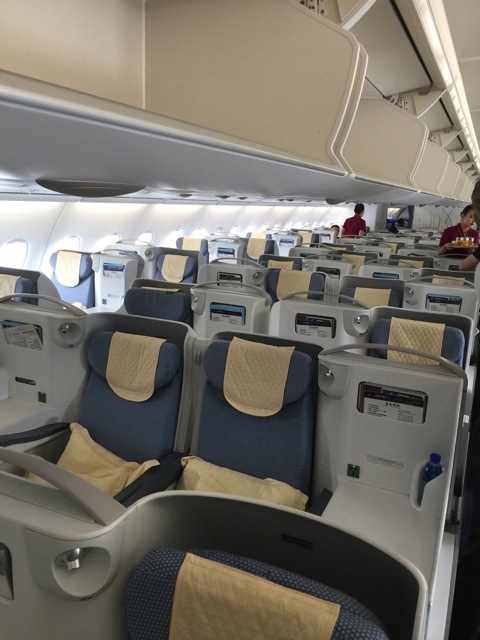 In the larger cabin however, the opposite is the case and the seats on even numbered rows are the ones away from the aisle. Stowage space is excellent, especially if you are sitting by the window. This is mainly due to the curvature of the hull. 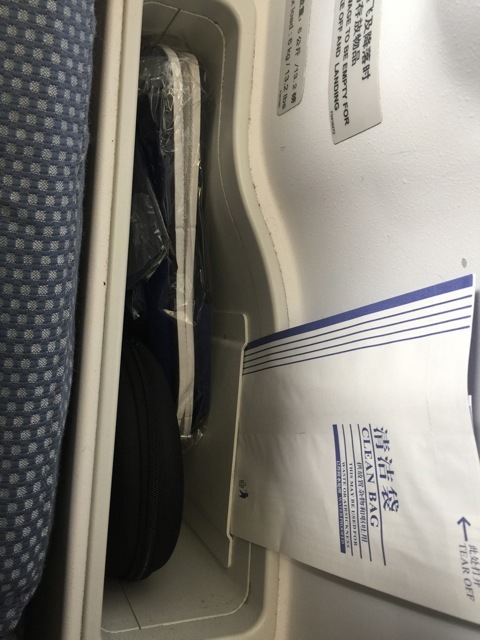 There is quite a gap between the wall of the cabin and the seat. 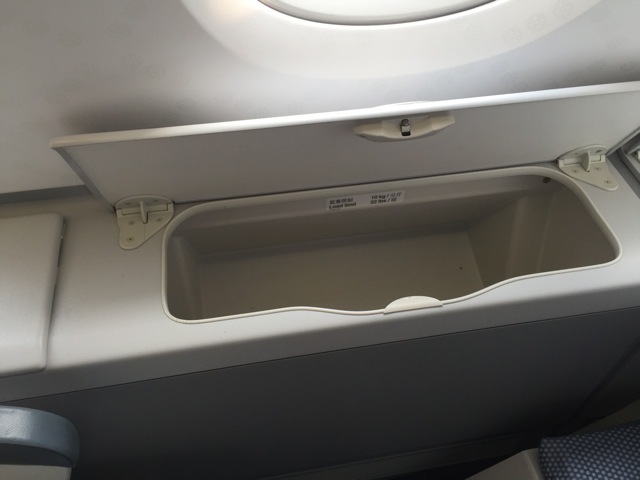 Airbus has put in extra storage bins in this space which are quite convenient. The seat extends into a fully flat bed. I am 184 cm tall. In the fully extended position I can lie stretched out and even have a little space left above my head. 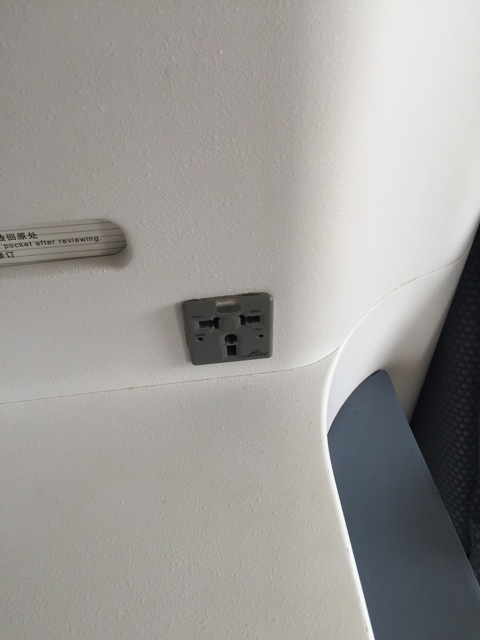 Facilities: AC and USB power ports are available in Business Class. 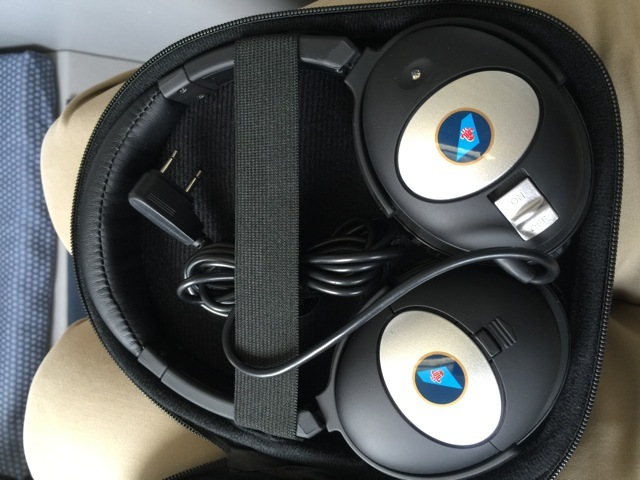 Audio and Video: Audio and Video on demand. The system can be operated either using the touch screen or the remote control. Just a word of warning here. 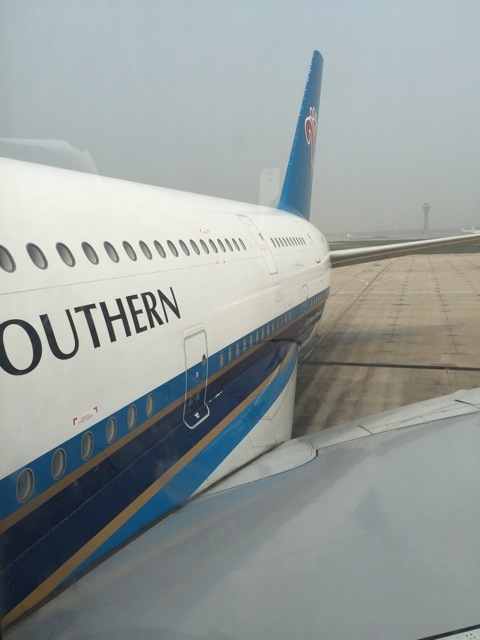 China Southern has the same strange policy that the American carriers have. 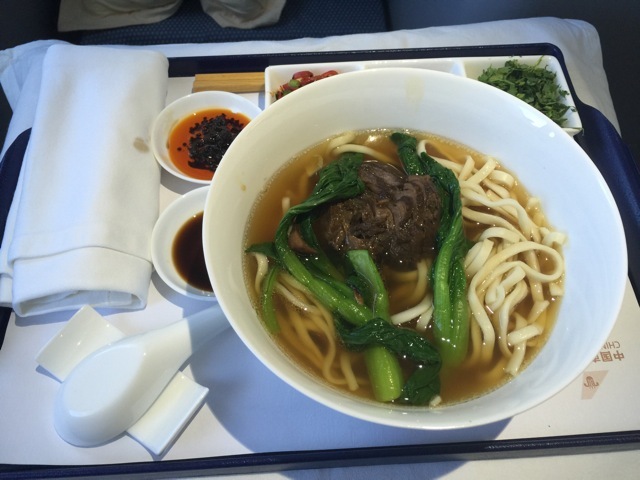 Their domestic Business Class is labelled as First Class. 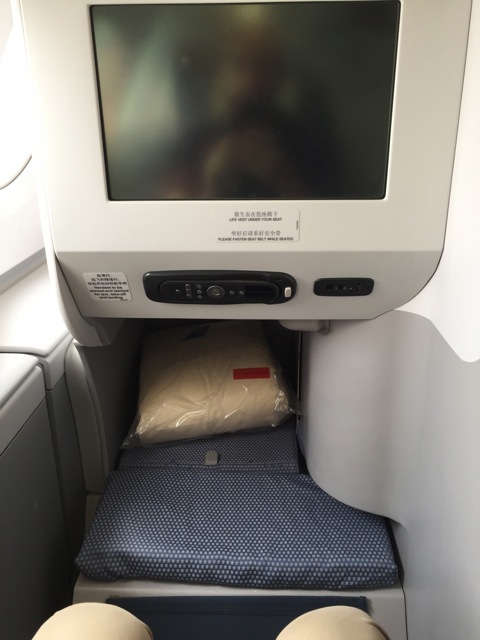 As a result, even though I booked First Class I am in fact sitting in the Business Class cabin of the beast. 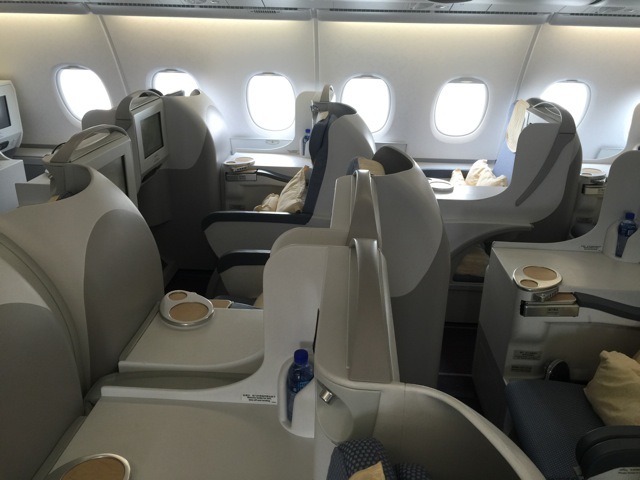 Apparently, the international First Class seats are not available for sale on this route. There is not really very much I can say about the cabin crew. They are courteous in the way they go about their duties, but other than that, interaction with the crew is somewhat limited by the language barrier. 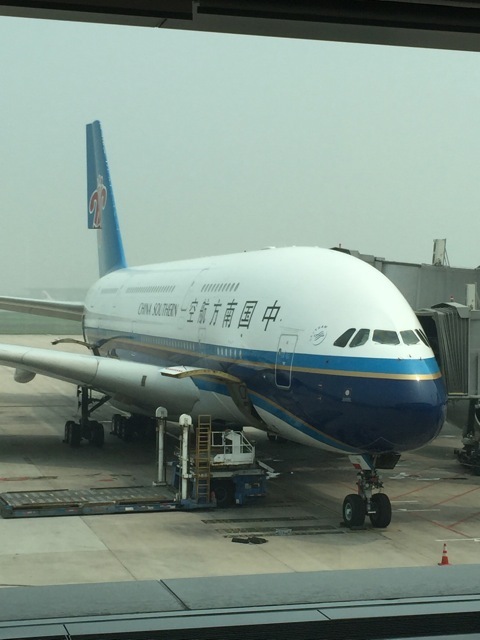 The seat looks as though it has been set up for a long-haul flight. There are two pillows and a thick blanket at every seat. 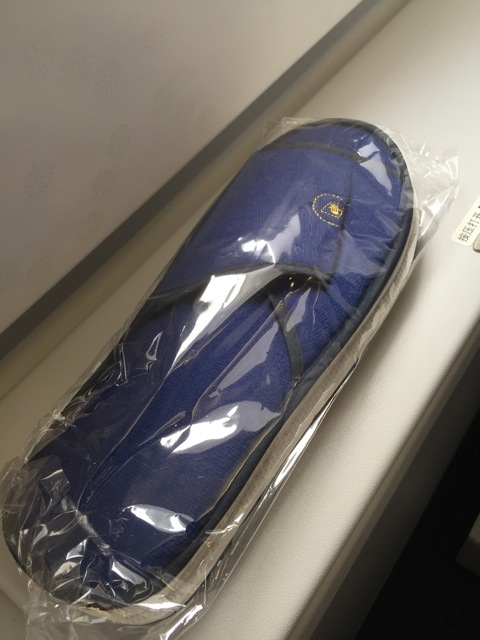 Slippers, a shoe bag, water and noise cancelling earphones are also available. Welcome drink on the ground: Apple juice. 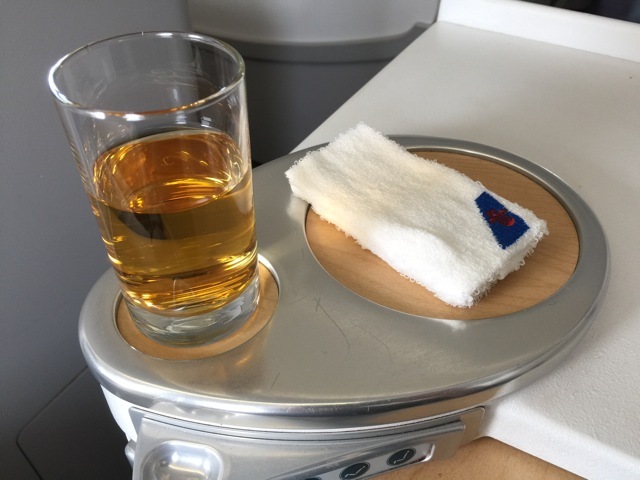 Towel before the meal: Cold, unscented towel served with the welcome drink on the ground. 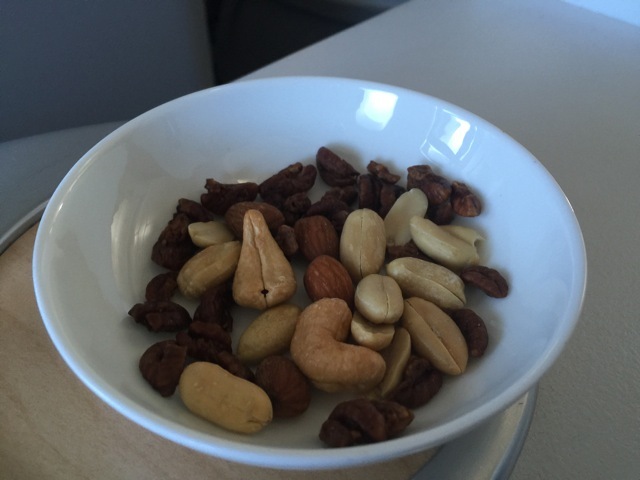 Pre-meal drink: Still water and a bowl of nuts. 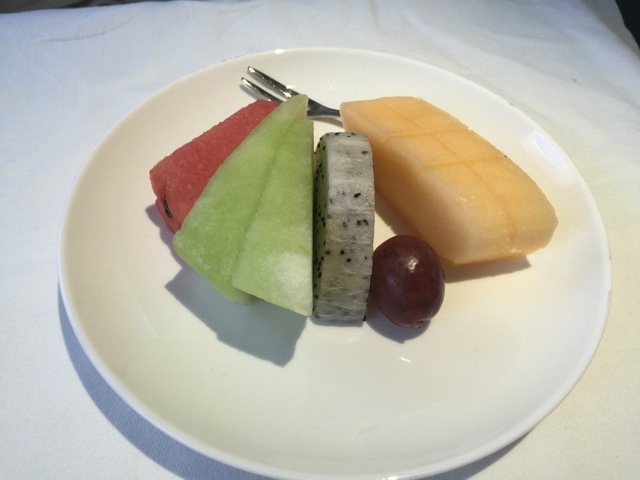 Choice: There are four choices for the main dish. Type of meal: Early dinner. 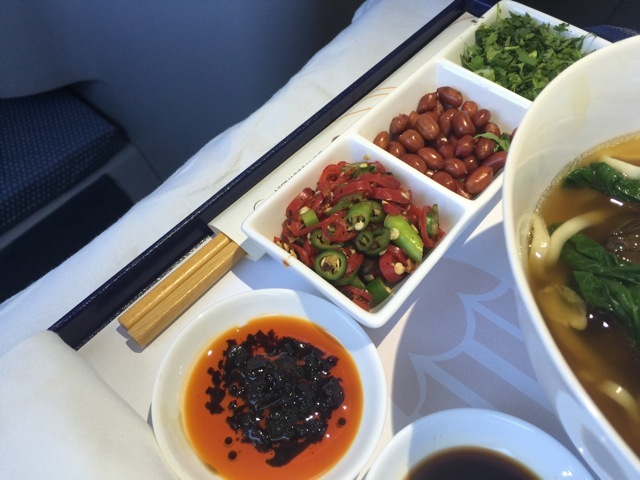 Menu: A menu is available, which the cabin crew will let you have a look at, if you ask nicely. However, she will wait by your seat until you have made a choice and will then disappear again with the menu. 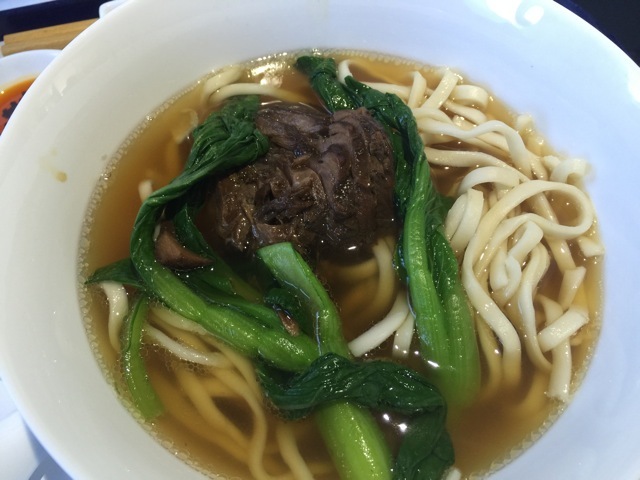 Noodle soup with braised beef and pak choy, condiments. Much to my surprise, the meal is excellent! The beef is incredibly tender and tasty. The noodles are chunky and chewy and the spicy sauce and the chilli give the soup a fragrant touch. 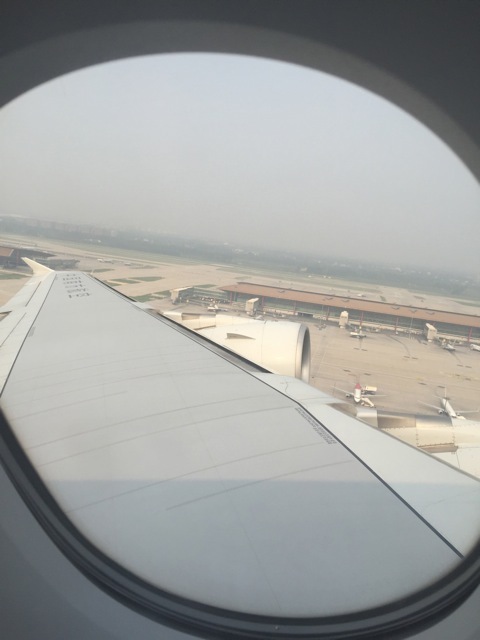 We fly a circuitous route into Guangzhou. Apparently there is a thunderstorm in progress. We do a few en route holding circuits at 38’000 feet, which looks pretty cool on the map, and as we start our descent into Bayun airport we are zigzagging around big towering CBs. 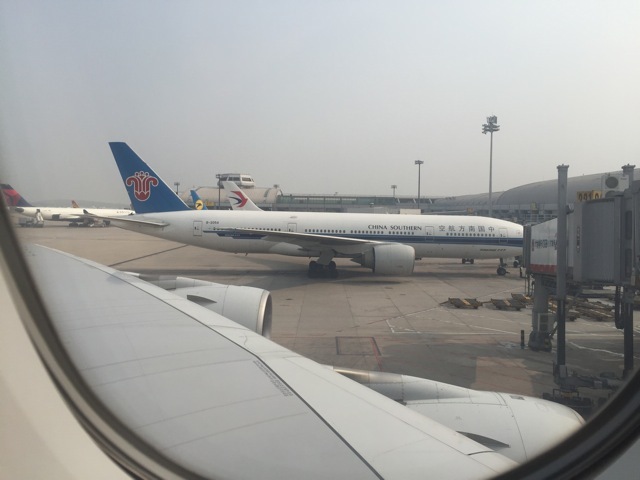 Eventually we land with a delay of 75 minutes, which seems pretty good by Chinese standards. 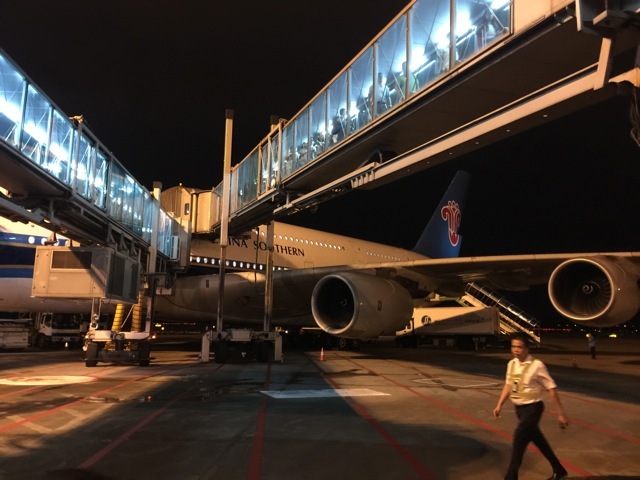 Our aircraft is parked at the international pier in preparation for its next flight, which means that all passengers will be bused to the terminal. There are dedicated minibuses for First Class passengers. 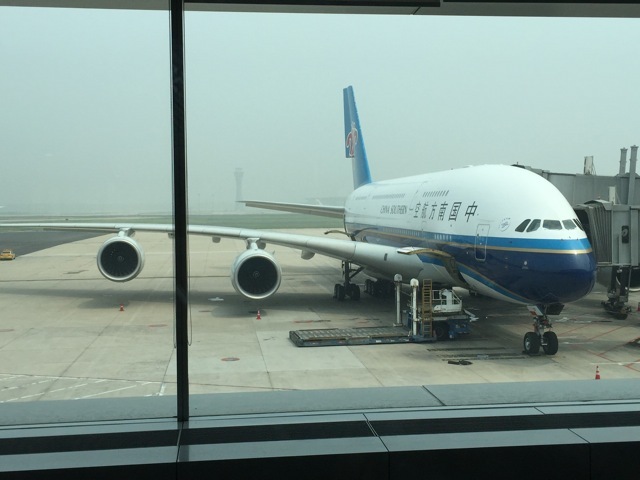 Most importantly, I get to see the A380 at ground level! Fare: RMB8.- per person for a single journey. 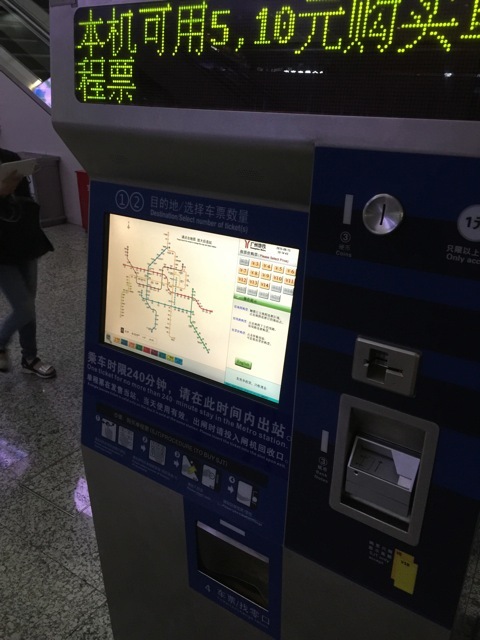 The ticketing machine only accepts cash and only note of RMB5 and 10. 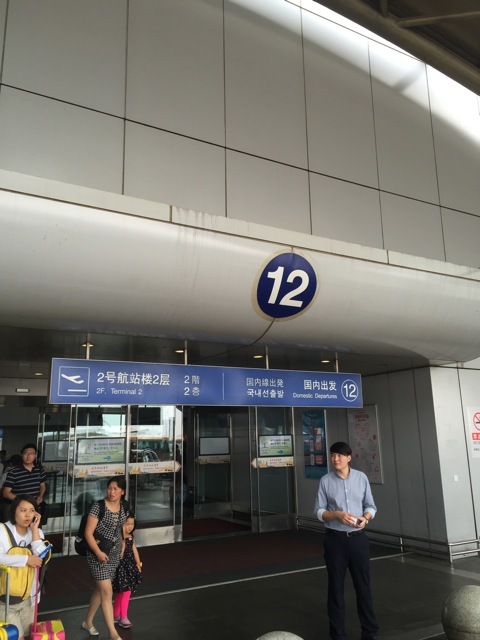 Baiyun airport is served by the number 3 metro line. From the airport it is about 45 minutes to Tiyu West Road, which is the terminus station of this branch of line 3. If you need to continue your journey on the line 3 in the direction of Panyu Square, exit the train on the right side at Tiyu West Road. The train bound for Panyu Square calls at the opposite platform. From there it is only one stop to Zhujiang Station, where my hotel is. 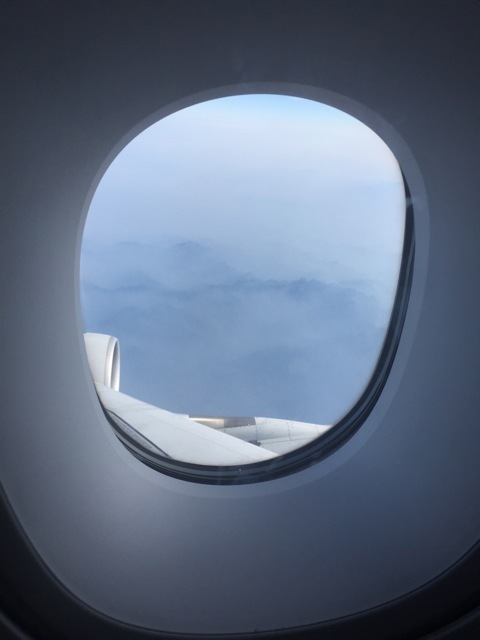 This entry was posted in Airbus A 380, China Southern, First Class and tagged airlines, aviation, Business Class, business class passengers, business class seat, China, China Southern First Class, China Southern First Class trip report, China Southern Trip report, departure gates, First Class, flying, leisure traffic, transportation, travel, trip report, trip review, vacation. Bookmark the permalink.